Kim English (September 6, 1970 – April 2, 2019) was an American electronica, soul, gospel, and house music singer. Throughout her career, English experienced success on the US Hot Dance Music/Club Play, Hot Dance Singles Sales, Hot Dance Airplay charts and the UK Singles Chart, beginning in the mid-1990s and continuing into the 21st century. Although her first chart entry on the Hot Dance Music/Club Play came in 1995 and was only a moderate hit ("I Know a Place", No. 32), her debut single was actually "Nitelife" in 1994, produced and written by Ten City. Between 1999 and 2002 she scored six hits in a row that hit the top two, five of those went to number one: "Unspeakable Joy", "Missing You", "Bumpin' and Jumpin'", "Everyday" and "Treat Me Right". All of these hit singles (excluding "I Know a Place") are featured on her debut album Higher Things , released in late 1998 on the New York City based record label, Nervous Records NYC. "Unspeakable Joy" and "Everyday" went on to become her most successful radio hits. The album also featured a cover version of Anita Baker's song "Been So Long". Ten City was a Chicago, Illinois-based R&B and house music act that enjoyed a number of club hits and Urban radio hits in the late 1980s and early 1990s and was one of the first exponents of deep house. Formerly known as Ragtyme, the group comprised vocalist Byron Stingily, guitarist Herb Lawson and keyboardist Byron Burke and were augmented by producer Marshall Jefferson. The group was signed by Atlantic Records and released the album Foundation in 1989, which became the group's only album to cross over, peaking at No. 49 on the US Top R&B/Hip-Hop Albums chart. Higher Things is the debut studio album of American singer-songwriter Kim English. The album includes the major Hot Dance Club Play chart hit singles, "Nite Life", "Learn 2 Luv", "Supernatural", "Unspeakable Joy", "Tomorrow" and "Missing You". By 2007, English had earned her sixth, seventh and eighth US dance number-ones with "It Makes a Difference", "C'est La Vie" and "My Destiny". All three hits are from her second album, titled My Destiny , which was released in late September 2006. All of her hits were released on Nervous Records. September 2009 saw the release of the single "Nothing's Impossible". My Destiny is the third and final album by singer-songwriter, Kim English. Includes the #1 Hot Dance Club Play hits, "Everyday", "Treat Me Right", "It Makes A Difference", "C'est La Vie" and the title track. 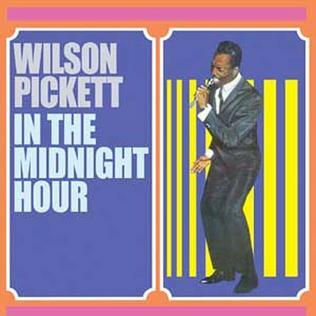 "In the Midnight Hour" is a song originally performed by Wilson Pickett in 1965 and released on his 1965 album of the same name, also appearing on the 1966 album The Exciting Wilson Pickett. The song was composed by Pickett and Steve Cropper at the historic Lorraine Motel in Memphis where Martin Luther King, Jr. would later be assassinated in April 1968. Pickett's first hit on Atlantic Records, it reached number one on the R&B charts and peaked at number 21 on the pop charts. Angie Stone is an American singer, songwriter, actress, and record producer. She rose to fame in the late 1970s as member of the hip hop trio The Sequence. Soon after, Stone began working with futuristic rap group Mantronix and singer Lenny Kravitz. 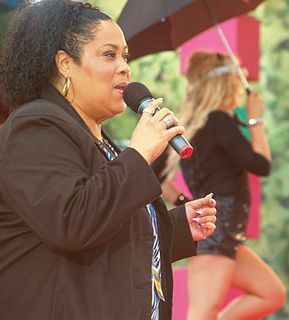 In the early 1990s, she became a member of the R&B trio Vertical Hold. In 1999, Stone released her solo debut Black Diamond on Arista Records, which was certified gold and spawned the R&B number-one hit "No More Rain ". After transitioning to J Records, she released another gold-seller, Mahogany Soul (2001), which included the hit single "Wish I Didn't Miss You", followed by Stone Love (2004) and The Art of Love & War (2007), her first number-one album on the US Billboard Top R&B/Hip-Hop Albums chart. Tenitra Michelle Williams is an American recording artist and actress. Williams rose to fame in the 2000s as a member of R&B girl group Destiny's Child, one of the best-selling female groups of all time with over 60 million records, of which more than 35 million copies sold with the trio lineup with Williams. "Lady Marmalade" is a song written by Bob Crewe and Kenny Nolan. The song is famous for its sexually suggestive chorus of "Voulez-vous coucher avec moi ? ", which translates into English as "Do you want to go to bed with me (tonight)?". The song first became a popular hit when it was recorded in 1974 by the American girl group Labelle. Labelle held the number-one spot on the Billboard Hot 100 chart for one week, and also topped the Canadian RPM national singles chart. Loleatta Holloway was an American singer, mainly known for disco songs such as "Hit and Run" and "Love Sensation", both of which have been sampled extensively. In December 2016, Billboard magazine ranked her as the 95th most successful dance artist of all-time. Shawn Christopher is a female African-American house-music singer from Chicago, Illinois. Martha Elaine Wash is an American singer-songwriter and actress. Known for her distinctive and powerful voice, Wash first achieved fame as one half of the successful act Two Tons O' Fun who sang backing for American disco singer Sylvester. After gaining their own record deal, they released three consecutive commercially successful songs which all peaked at number 2 in the dance charts. The duo was renamed The Weather Girls in 1982 after they released the top-selling single "It's Raining Men", which brought the duo to mainstream pop attention. As a duo, The Weather Girls released five albums and were heavily featured on Sylvester's albums. Jeanie Tracy is an American singer-songwriter, actress, and record producer. Vernessa Ann Mitchell is an American contemporary Christian and gospel recording artist whose vocal versatility has been heralded by R&B and House audiences. "Emotion" is a song written by Barry and Robin Gibb. It was first recorded by Australian singer Samantha Sang, whose version reached number three on the Billboard Hot 100 chart in 1978. The Bee Gees recorded their own version of the song in 1994 as part of an album called Love Songs which was never released but it was eventually included on their 2001 collection titled Their Greatest Hits: The Record. In 2001, "Emotion" was covered by the American R&B girl group Destiny's Child. Their version of the song was an international hit, reaching the top ten on the US Hot 100 chart and peaking in the top five on the UK Singles Chart. "If I Can't Have You" is a disco song written by Barry, Robin and Maurice Gibb in 1977. The song initially appeared on the Saturday Night Fever soundtrack in a version by Yvonne Elliman, released in November 1977. The Bee Gees' version appeared a month later as the B-side of "Stayin' Alive". "Love Can Move Mountains" is a song by Canadian singer Celine Dion, recorded for her second English-language studio album, Celine Dion (1992). Written by Diane Warren and produced by Ric Wake, it was released as the fourth single in October 1992. It is an up-tempo pop song drawing influence from gospel and dance music, and its lyrics detail the abilities that love has as an emotion. "Love Can Move Mountains" was later included on Dion's greatest hits albums, All the Way… A Decade of Song in 1999 and My Love: Ultimate Essential Collection in 2008. Unexpected is the third solo studio album by American singer Michelle Williams. It was released by Columbia Records and Music World Entertainment on October 7, 2008 in North America. Her first solo project following the disbandment of her group Destiny's Child in 2006, it marked Williams' first full-length dance-influenced commercial pop album, moving away from the gospel style of her previous efforts Heart to Yours (2002) and Do You Know (2004). Unexpected fuses dance-pop, R&B and electronic music to form a wide selection of up-tempo, beat-driven, club-oriented songs which gradually calm into slower material more R&B in sound and style. American recording artist Michelle Williams has released four studio albums, one compilation album and fifteen singles. 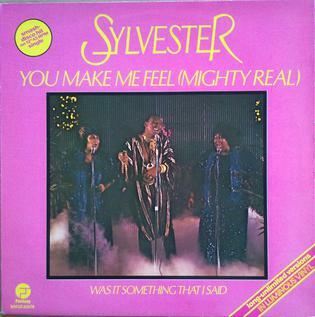 "You Make Me Feel " is a 1978 single by American disco/R&B singer Sylvester. The song was written by James Wirrick and Sylvester. It appears on Sylvester's 1978 album, Step II. Music critic Robert Christgau has said the song is "one of those surges of sustained, stylized energy that is disco's great gift to pop music". Maurice Joshua, also known just as Maurice, born in Chicago, Illinois, is a Grammy Award winning record producer who is most known for his laid-back and soulful house music-style remixes. Journey to Freedom is the fourth studio album by American recording artist Michelle Williams, released on September 9, 2014 by E1 Music and Light Records. It marked her first release under the label after severing professional ties with longtime record company Columbia Records and manager Mathew Knowles in 2009. Following a hiatus from her recording career, Williams' album, a collaboration with main producer Harmony Samuels, was a fusion of both urban contemporary gospel and R&B sounds. 1 2 3 4 5 Weingarten, Christopher R. (April 5, 2019). "Kim English, Who Blended Gospel With Dance Music, Dies at 48". nytimes.com. Archived from the original on April 6, 2019. Retrieved April 19, 2019. ↑ Phares, Heather. "Biography: Kim English". Allmusic . Retrieved September 9, 2010. ↑ Roberts, David (2006). British Hit Singles & Albums (19th ed.). London: Guinness World Records Limited. p. 184. ISBN 1-904994-10-5.